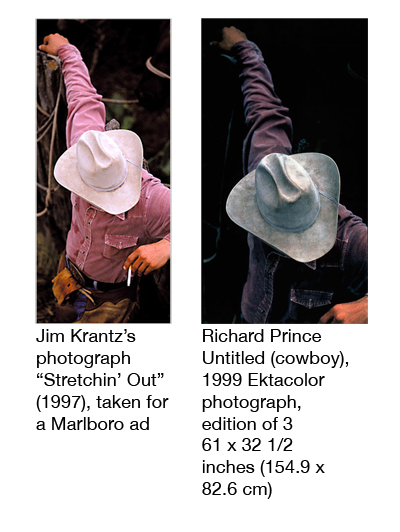 Appropriation artist Richard Prince has made a fortune in the art world by copying the work of other photographers in magazine advertisements and blowing the images up for exhibition. Call it post-modern whatever -- but is it art? Prince's technique involves appropriation; he pilfers freely from the vast image bank of popular culture to create works that simultaneously embrace and critique a quintessentially American sensibility: the Marlboro Man, muscle cars, biker chicks, off-color jokes, gag cartoons, and pulp fiction. 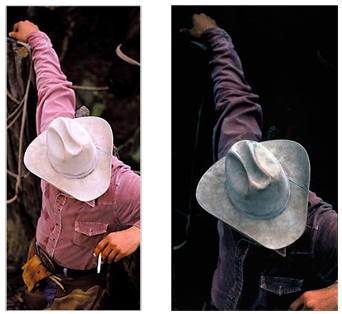 On the left is Jim Krantz's 1997 photograph called "Stretching Out", which was used in a Marlboro ad. To the right is Prince's appropriation of the same picture blown up to 61 x 32 inches. Nowhere does Prince credit the original work or the photographer. Perhaps one reason for this oversight is that in doing so Prince would have to share credit with the creative force he mocks in his own art. In other words, Prince doesn't have a very high opinion of the commercial images he appropriates from magazines because he only sees this form of art as an extension of capitalism, and not as a form of expression. This then brings up the whole "high art" or "low art" debate. What makes Prince's appropriation interesting is that the iconic nature of the Marlboro pictures signify the cultural pathology of a society obsessed with self-indulgences, individualism, identity and consumption. By appropriating the images, Prince is taking a poke at the very same "high-art" culture that is willing to fork out hundreds of thousands of dollars for his work. Prince has taken a once negatively viewed practice, the reworking of well-known art and images, and has turned it into his own celebrated art form -- one that demands its own value as a commodity. See any irony here? Where this practice leaves those photographers who work to produce pictures for commercial purposes is anyone's guess. However, in the end, we can assume that in the eyes of Richard Prince, the status these photographers occupy is pretty low on the food chain of public perception in terms of what counts as art in America. Yet, these are the very pictures that have shaped the culture we have today.